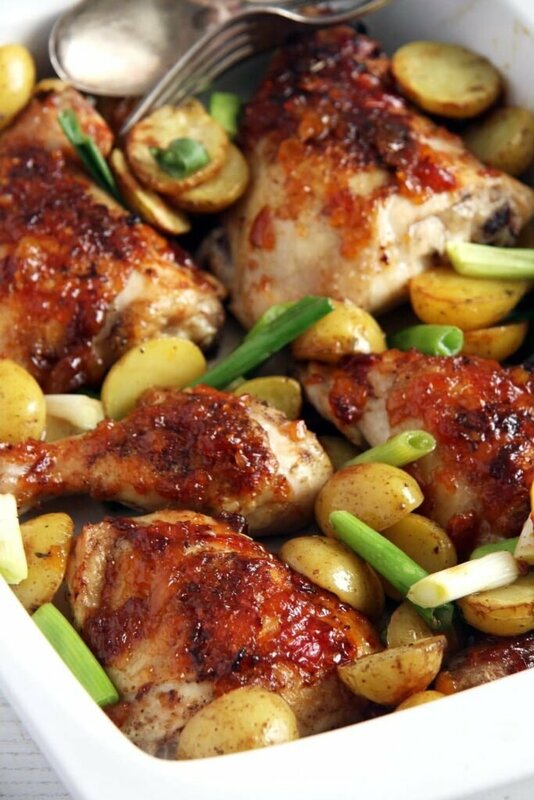 Incredibly delicious sweet and sticky chicken legs glazed with mango chutney and roasted with potatoes and green onions. 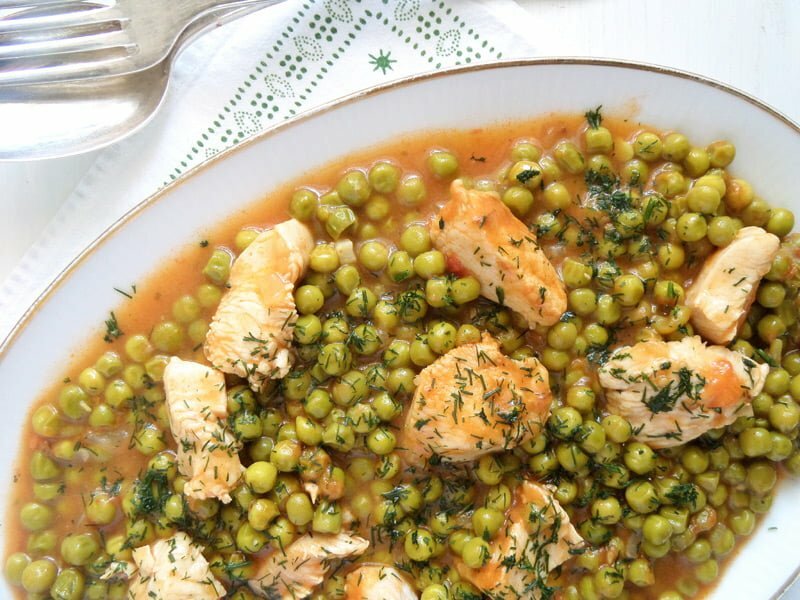 Chicken legs are something that you will find very often on our meal plan. If I ask my kids what they want to eat, it is very likely that they will say “chicken legs”. So I have to be creative when making them, because if I was only to eat them cooked in one way, I would get bored very easily. I don’t think the kids would mind that so much, as long as there are chicken legs and some potatoes on their plate, they don’t really care about the rest. But I do! I wanted to find a way to include green onions in this recipe, I liked the roasted green onions from the previous post so much, and I wanted to see how they will be when cooked together with other ingredients. I have to say that I was extremely pleased with the result. 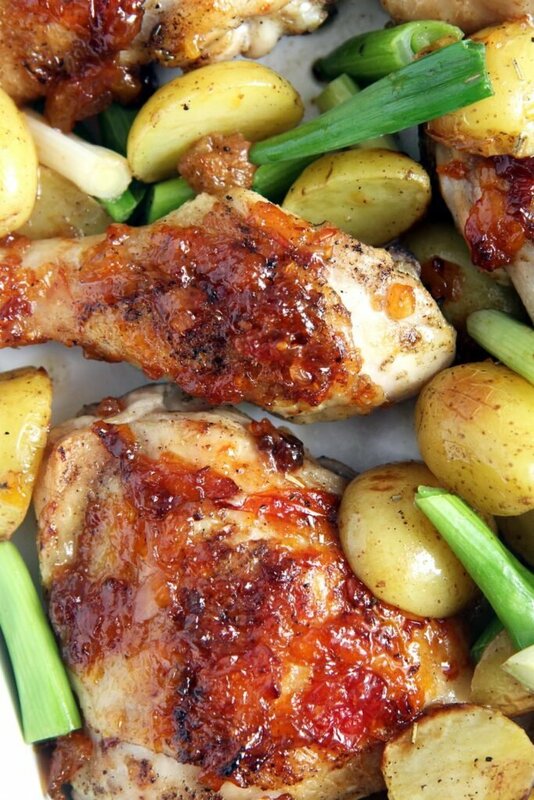 Tender, sweet chicken legs surrounded by rather crispy potatoes and topped with those wonderfully aromatic roasted green onions. But before I give you the recipe, I wanted to clarify the difference between green onions, spring onions and scallions. I am not a native English speaker, so I have to say that I was rather confused by the terms at the beginning. I used to use them interchangeably, but now, after doing a little bit of research I found that there is a difference between some of these terms. Apparently green onions and scallions are the same thing, the long and slender onions, which are harvested when very young, before having the chance of forming the bulb. They are less intensive in taste than the spring onions, so the best way to eat them is raw or very slightly cooked. The spring onions are harvested later, so they have a rather plump bulb at the base. They are normally planted in autumn and harvested in spring, that is why they are called spring onions. Another reason people might confuse these different sorts of onions is the fact that the green onions/scallions are actually called spring onions in the UK and Canada. So the best way of telling them apart is the bulb: thick bulb – spring onions, no bulb – green onions/ scallions. 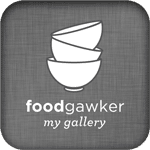 I use them mostly interchangeably, I buy, cook and eat what I find. Still if you don’t like a too strong onion taste, than use green onions/ scallions when you plan to leave the onions raw, the spring onions have a stronger taste. I used green onions in this recipe, but you can definitely replace them with spring onions. Same goes for the Roasted Green Onions on Creamy Polenta. I used homemade mango chutney for this recipe, because mango chutney is not really easily available around here and when it is, it is not very good, so I stopped buying it. You can absolutely use your favorite brand of mango chutney, or experiment with other chutneys as well. My chutney was rather chunky, so I blended it for just one moment, it still has bits in it, but not as coarse as before. And just another word: this dish cannot be easier to make, clean and put everything on one tray and you’re done. Wash and dry the chicken legs and halve them at the joint. Sprinkle them with salt and pepper on both sides and place them in a large baking tray, skin side up. Smear the mango chutney on the chicken legs. Thoroughly clean and dry the potatoes but leave the skin own. According to their size, you can either leave them whole or halve and quarter the larger ones. They should all have pretty much the same size. Spread them on the baking tray around the chicken legs. In the meantime, clean, top and tail the green onions and cut them into 5 cm/ 2 inch pieces. After the 20 minutes baking time, spread them on top of the potatoes in the baking tray. 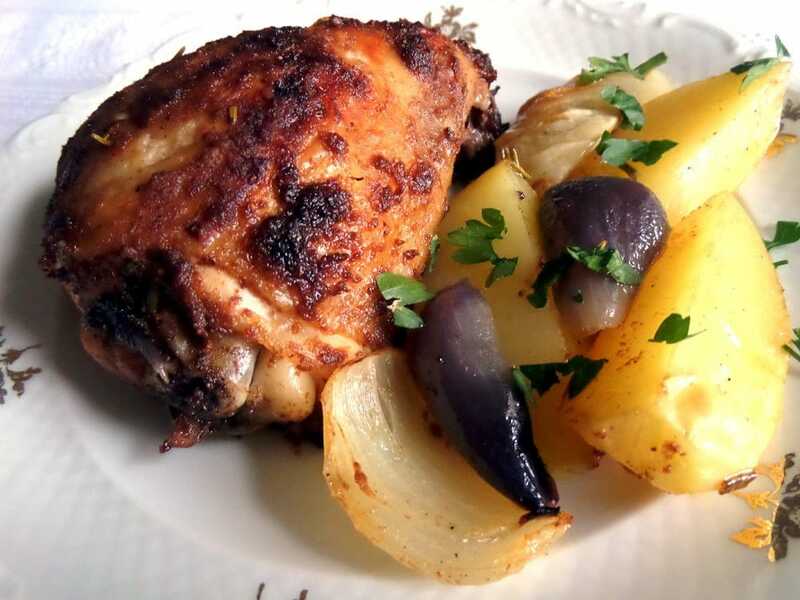 Continue baking for another 15 minutes or until the chicken juices run clear, the potatoes are fully cooked and the onions are tender and slightly brown. Looks amazing! I’m not a chicken leg fan but I think I might become one if I lived at your house! Oh, mama! 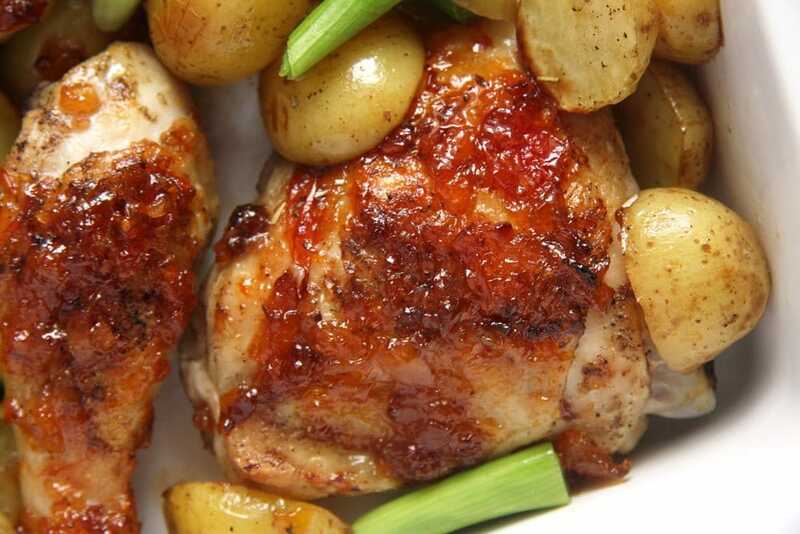 Mango chutney is one of my favorites and so good on baked chicken. I love the combination of flavors you have going on in this dish. 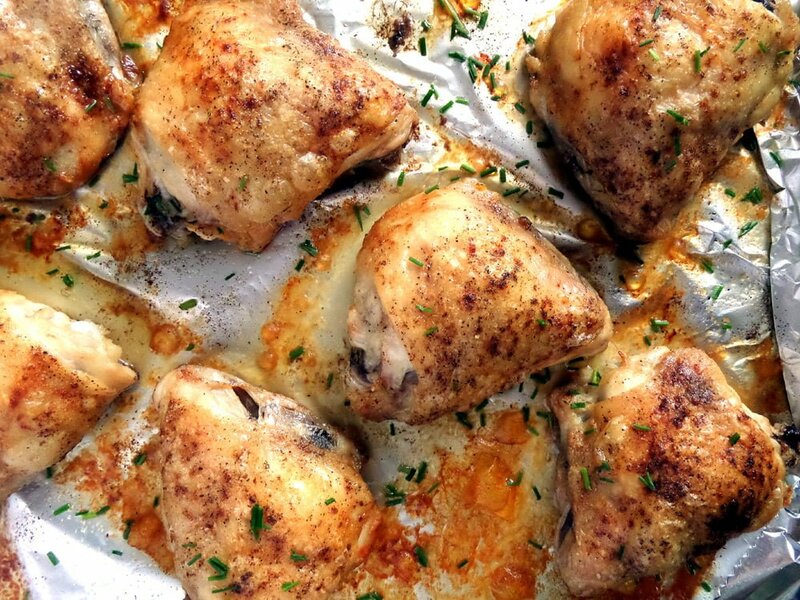 My kids love chicken legs, too, and admittedly they aren’t my favorite, but I would eat these with no problem at all! I have some Major Grey’s in the outside fridge, but may give your chutney recipe a whirl. Yum! Thank you, Kim, I hope you try it. Oh wow, these look so incredible! I always love having another fantastic chicken dinner in my arsenal :-). Love the flavor combination. Oh yum! This looks fantastic and so easy. Pinning! !